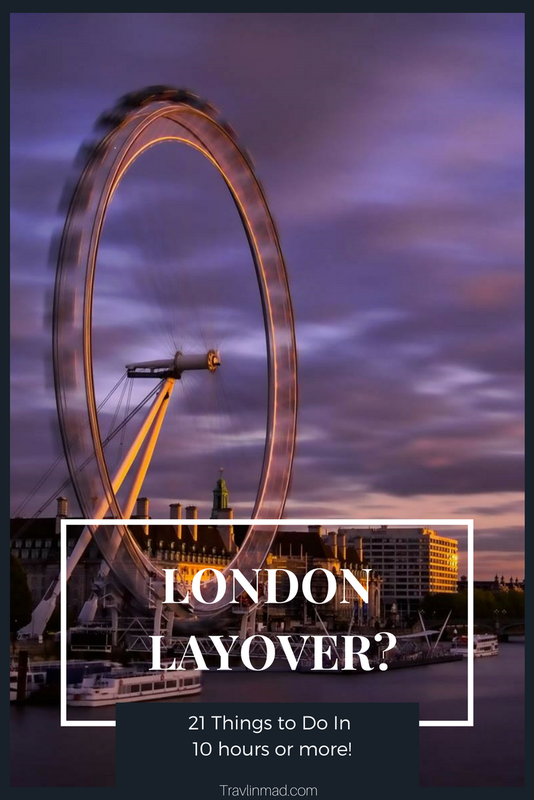 As one of the busiest airports in the world connecting flights into all of Europe and many other parts of the world, London Heathrow (LHR) is one of the major airports you're likely to bounce through on your European travels, and end up with a long layover in the process. If you're going to have a long layover, Heathrow is the place to have it. And since London is, well, London... we love the idea of adding an extra day trip onto our itinerary to enjoy one of the world's grooviest and most historic cities. 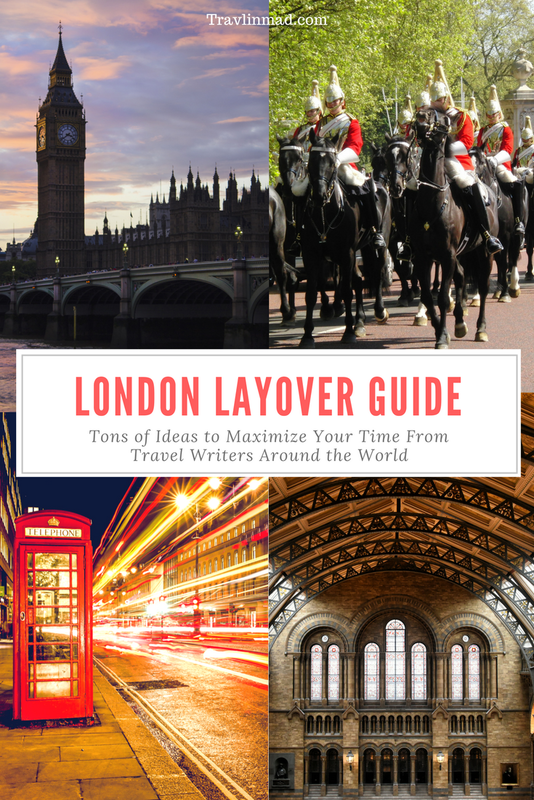 I asked 16 fellow travel writers, bloggers, and photographers around the world what they would do with a long layover in London - and here’s our collective advice to you… Keep calm and ditch the carry on at the airport. Here's how to experience the best of London Town with a 12 hour Heathrow layover or more and make it to your flight on time! First, decide if you have enough time to leave the airport. Generally if your layover is a minimum of 6 hours, you should be fine to leave, provided your bags are stored. Consider Buying an Oyster card - A Visitor Oyster card is a smartcard that pays for journeys on bus, Tube, tram, and other transportation services in London. Load money on your Oyster card and use it to pay as you go. Our travel experts like Eric of TravelBabbo are always on the road and suggest leaving your carry-on bags at Heathrow and bringing only a day pack, a camera and a raincoat with you to London. “Head to the Heathrow Tube station, buy an Oyster card at the machine and load £15 pounds onto it. We always have a balance on our Oyster cards, but we keep them with our Pounds and bring them with us for our next visit or layover." If you're likely to visit London again, the card may be a good bet for you. Store your bags - There are left luggage/baggage storage facilities in each terminal at Heathrow airport that can store your bags for a few hours or up to 90 days. Prices for up to 24 hours start around £11 pounds (around $15 USD) per item. The Heathrow Express is the fastest link between Heathrow and central London. Non-stop trains run to Paddington every 15 minutes, and journey time is 15 minutes from Terminals 2 and 3 (a few minutes more from Terminals 4 or 5). The London Underground (aka the Tube) is a cheaper option by rail route to London. Piccadilly Line trains run from all terminals and journey time is 50–60 minutes. NOTE: These recommendations are based on London layovers of 10-20 hours, from touchdown to takeoff. Some of these ideas can be done in less time depending on your pace. As a general rule, allow yourself 4-5 hours to deplane, speed walk through the airport, clear immigration, store any carry ons, take the train into and back out of London, back through security (2 hours before your flight), and to your departing gate! London's must-see attractions and museums are fun whether you're a First Timer or a London Pro. As Eric of TravelBabbo suggests, "one of the great things about British museums is that most of them are free. And if it’s raining out (a likelihood), the museums are a great default destination." Fancy a glimpse of Harry and Meghan in their new home? With a little luck and a shorter 8 hour London layover (ish) you can see something iconically British, and Windsor Castle is your best bet. It's the closest attraction to Heathrow airport, and just 20 minutes by private car or taxi, or closer to an hour by bus (First Berkshire bus 8 is now the only direct bus between Heathrow and Windsor. Buses run every 30 minutes, hourly on Sundays. Allow 2-3 hours. The 900-year-old official residence of The Queen and the largest occupied castle in the world. There are also private Windsor layover tours from Heathrow. Adult ticket £20.50, Kids Under 5 Free. Eric of TravelBabbo recommends the London Transport Museum at Covent Garden as "a great place for kids." And he should know - Eric takes his kids everywhere! Located in the old Flower Market building in Covent Garden Piazza, the LT Museum tells the story of London's transport system over the last 200 years. "It’s not free, but it’s a fun place for kids to explore." And Covent Garden makes a perfect rainy day spot as well. "If it’s raining, or if we want to get lunch, we’ll head to Covent Garden which is enjoyable and protected from the elements." Adult ticket £17.50, Kids are Free. Katja from Globetotting also recommends some free things to do in London with kids — over 32 great ideas! If you're a fan of military history, adventure travelers Megan & Mike from Mapping Megan and Waking Up Wild think you'll love taking in some of London's most iconic military traditions. "Depending on the timing of your layover, heading out to witness London's Military Traditions is a great experience. Granted, the Changing of the Guard is a tourist trap, though it’s something everyone should see. It runs every day in the summer at 11:30, and visitors are advised to arrive early. Those who request permission in advance can also witness Ceremony of the Keys, the nightly lock-up of the Tower of London. Every night for the past 100 years, the Yeoman Warders have performed the same gate-closing ritual. It has never been cancelled!" Free. Historic Trafalgar Square is another favorite of our travel experts, and easily reached by exiting the tube train at Piccadilly Circus. "Walk toward Leicester Square and turn right to get to Trafalgar Square where you’ll find the National Gallery. "There are numerous bakeries and places along the way to get quick snacks if you or the kids are hungry. Continue walking to Leicester Square and turn right to get to Trafalgar Square where you’ll find the National Gallery." Sarah and Kris from Jetsetting Fools agree. "Don't leave Trafalgar Square before spending a couple hours visiting the National Gallery, an art museum with a collection of more than 2,000 paintings. You'll see works of art by Monet, Rembrandt and van Gogh." The London Eye is a popular stop just off the London Bridge and a great area for wandering around. Vicky of Buddy the Traveling Monkey especially loves it at night! "What better way to see London than from the top of the London Eye at night! It may be a bit touristy, but we think it’s worth a visit (and Buddy agrees)." Among other fun facts, "it's Europe’s tallest Ferris wheel, standing at 443 feet tall, and sits on the South Bank of the River Thames. There are 32 air-conditioned capsules big enough to hold 25 people comfortably. In fact, you can walk around the capsules easily to ensure you see the city from all angles. And one full loop around takes approximately 30 minutes, so you’ll have plenty of time to enjoy the sights while you’re up there." She highly recommend getting your tickets in advance though. "It's such a popular attraction. You can even pay a little extra for “Fast Track” tickets that allow you to jump the queues which will definitely save you some time." Fast Track tickets online from £32.45. Brianna of Casual Travelist is a big fan of the British Museum in Bloomsbury. “If I've got a day in London in between flights I'm making a beeline for the British Museum. It's free and open daily. Spend a few hours perusing the museum's fascinating collection of over 8 million artifacts that celebrate human history or check out one of the thought-provoking special exhibitions that delve into art and culture." Free. "If the timing is right, a layover in London is perfect for experiencing some of the city’s most iconic landmarks and traditions. On most Saturdays and when Parliament is not sitting, visitors have the opportunity to take a guided tour of the Palace of Westminster followed by afternoon tea on the banks of the Thames, right under Big Ben’s famous clock tower," says Katy of Untold Morsels. She looks for culture wherever she goes, and what better lesson in culture can you get than with British High Tea. "Your tour will take you right inside the Houses of Parliament where you can walk in the footsteps of Kings, Queens and historical figures and even sit in the House of Commons. Afterwards, enjoy a decadent afternoon tea including sandwiches, scones, cakes and your very own pot of English tea." Adult tour ticket: £20. Afternoon tea: additional £29. Lovers of modern art should head straight for Central London during their layover. Dorothée of The Touristin and Jenny from A Taste of Travel both recommend seeing the amazing modern art at the Tate Modern and a great view of the city at one of London's newest attractions. "The Switch House of the famous modern art gallery Tate Modern just opened" said Dorothée, "and the free viewing platform there offers one of the hottest 360 degrees views over town." Viewing access is free however you might have to queue during busy times. Museum is free, additional exhibition fees may apply. A good old-fashioned walkabout can be one of the best ways to spend your layover, and these four encompass many of London's most famous landmarks. Or just follow your feet some of the prettiest streets in London. Wherever they take you, walking in London is so much better than sitting at the airport! Sarah and Kris of JetSetting Fools suggest "first timers head straight into the heart of London to take in the city’s top sights on foot. With a long layover, there are endless possibilities to explore." They like the well-known Westminster borough for seeing the city’s most iconic sights - Buckingham Palace, Westminster Abbey, and Big Ben." "Stroll along the Victoria Embankment, and make sure to walk onto the Golden Jubilee pedestrian bridge for a view and photo op of the London Eye and Big Ben from afar. Weave your way back into the city and wander the lantern-lit streets of Chinatown, which is a fabulous spot for a meal (we recommend Lido for dim sum). End your time in London on Regent Street, the city’s most prestigious shopping thoroughfare." Jenny from A Taste of Travel also recommends exploring a part of London on foot. "At the Tower of London, bypass the queues, walk around the Tower and cross London's iconic monument, the Tower Bridge. From here, walk along the river front until you come to the London Bridge and one of my favorite places, Borough Market. Continue along the river past Shakespeare's Globe Theatre and the Tate Modern museum. Keep walking along South Bank and you'll come to the London Eye where a bird's eye view of the city awaits you from this giant ferris wheel. From here it's not far to Westminster Bridge where you cross the Thames. Check the time as you pass Big Ben and head towards Buckingham Palace to say goodbye to the Queen." As a London transplant, Melissa from MelBTravel appreciates history. Her scenic self-guided walking tour takes in some of London’s most famous sites for free. "This should only take a couple of hours to do if you are stopping to take pictures, and there are plenty of places to drink and eat along the way." "Start your walk at the front of The Old Thameside Inn, which has a giant replica of Sir Francis Drake's Ship next to it, passing Shakespeare's Globe Theatre, then stopping at the Tate Modern to take pictures of the Millennium Bridge and St Paul's Cathedral across the Thames. Next you will pass the OXO tower and Gabriel’s Wharf, where you can stop for lunch. From there, go past the National Theatre and finish your route at the Royal Festival Hall, where both the Hungerford Bridge and Golden Jubilee Bridge are situated. Cross the Hungerford Bridge to get some amazing pictures of The London Eye and Westminster Abbey." Who knew London had a "Little Venice"? This recommended walk along the Regent Canal from Jenny at A Taste of Travel looks idyllic. "It's a 10 minute walk from Paddington Station (where the Heathrow Express arrives from the airport) or a 4 minute walk from the Warwick Avenue tube station to the Warwick Avenue Bridge where the canal walk starts. "Wander around Browning's Pool where the two main canals, Regent's Canal and Grand Union Canal, meet. There's a little cafe here called Waterside Cafe or after you have walked a little way along Regent's Canal, Cafe Laville is another that sits over the canal before it disappears under the A5 at Maida Vale. This walk along the canal to Camden is around 5 kms and would take 2-2.5 hours depending on your stops. Shortening the walk to accommodate time is easy by catching a taxi at Regent's Park Road. If you follow the canal to Camden Road Market, you can catch the tube at the Camden Town station to your next stop!" Strolling a London neighborhood or market is a great way to experience so much of the city in one destination. "Whenever I touch down in London, my first thought usually revolves around how quickly I can get to one of the city's markets" said Natalie from Cosmos Mariners. And we agree. In fact, half of our travel writers reported they all love scoping out London's markets for everything from antiques to amazing street food. A crowd favorite amongst foodies and several of travel experts like Jenny of A Taste of Travel, Melissa of MelBTravel, Dorothée of The Touristin, and Lisanne and Jeffrey from Chapter Travel all love checking out the Borough Market when they're in town. "It's been here for 1,000 years" Dorothée said, "and it's just a two minute walk from the London Bridge Underground station." Regarded as the oldest market in the city, big props go to the amazing fresh produce and to tasting the artisan cheeses and wines from the UK. Or grab a coffee and chat with the local farmers. Oh, and the bread here gets a huge nod from everyone. "The huge selection of doughnuts at Bread Ahead will definitely tempt you!" Jenny says. "Whatever you do, save room for a quick bowl of pasta at Padella, on the edge of the market. There's always a queue but it seems to move quickly and it's worth the wait!" It's easy to get to: Catch the tube to London Bridge Underground station (Jubliee or Northline). From there, it's a two minutes walk to the Borough Market. Lisanne and Jeffrey of Chapter Travel recommend checking out Camden Market. "Here you can find cool vintage shops and lots of amazing street art. You can reach the market from the Hop On, Hop Off bus and it's open 7 days a week!" Camden Lock is the central hub of Camden's huge market, which is home to more than 100 shops and stalls. Natalie of Cosmos Mariners loves the Saturday market along Notting Hill's Portobello Road. "It's my favorite and it's easy to do on a layover: just take the Heathrow Express to Paddington Station (about 15 minutes). Paddington Station is connected to the Edgeware Road Tube station via a 5-10 minute walk through an underground passageway; at Edgeware Road, hop on the Circle or District line for two stops to Notting Hill Gate (10-20 minutes). About an hour after you leave Heathrow, you can be exploring the stalls, trying on clothes, and sampling the food (like the giant, fresh doughnut I just had to have!) at Portobello Road market. Even if your layover is on another day other than Saturday, Portobello Road's permanent shops are still worth a visit: you'll find all sorts of antiques and funky clothing stores here every day of the week." If you only have a short time in London and want to explore more than the usual tourist spots, Amy from The Global Creator suggests heading to the artsy cultural neighborhood of Shoreditch in East London. "You can easily get to the area on the Tube, the closest stations being Old Street on the Northern Line or Liverpool Street on the Central, Circle, Hammersmith & City or Metropolitan lines. Once you're there, fuel up at The Jones Family Project on Great Eastern Street. This place has a great ambiance, pulling in elements of the East London art culture and focusing on sourcing local, sustainable products for their restaurant." Check out Amy's Pocket Guide to Shoreditch. "To get a snapshot in a must-see spot, head to Box Park. The bright street murals decorating the streets in that area have become iconic for the new East London and its artsy, edgy scene." It's not just for the punks anymore. The unique street art in Shoreditch is worth the trip! Close to Shoreditch and near the River Thames is Whitechapel in the London Borough of Tower Hamlets, home to London Metropolitan University's Art School. The vibrant alternative culture here has cool vintage shops, a rich Asian cultural influence, vintage shops, and the Whitechapel Art Gallery. Also nearby is one of London's oldest market, Spitalfields Market, which Amy highly recommends. "It's a great spot for finding all sorts of cool goods", and she knows her way around inspired global goods as Head Creator at The Global Creator. "If it's a bit early when you get into town, head first to the nearby Hummingbird Bakery in Spitalfields for coffee and amazing cupcakes (they open at 11am)." Even on a shorter layover, you still want those IG souvenirs to take with you, and there are so many great spots to choose from in London. But 22 Instagrammable spots is almost too much to ask -- and with a map too, so you can find them all in time to catch your flight! You're a Tourist, So Go Ahead and Tour! You may think it's touristy - because it is! But a Hop On, Hop Off bus tour can be a great way to get an overview of any city. The added flexibility of hopping on and off as you please allows you to explore at your own pace depending on how much time you have. Jenny from A Taste of Travel and Lisanne and Jeffrey of Chapter Travel all recommend taking a London layover tour - whether it gets you to your ultimate self-guided walking tour or you never leave even the bus. "London is really huge, so it can be hard to pick where to go during your layover. If it's your first time and you want to see as much as possible" says Lisanne, "it's a really useful way to see as many of the iconic places as you can. They sell a variety of tickets, for 24 and 48 hours, or longer." There are 3 main Hop On, Hop Off tour operators - The Original London Tour, Big Bus, and Golden Tours. Want a little more British style than a tourist bus? Then seeing the classic sights of London in a classic Mini Cooper may be the ticket. Travel Writing Pro Claudia recommends the popular smallcarBIGCITY. "Buy a round trip Heathrow Express Train ticket online - the fastest way to get from Heathrow to London Paddington - and from there, meet your smallcarBIGCITY for a guided tour. It's perfect for first-time visitors or anyone who wants a customized London tour" she says. "They offer 1, 2, 4, and even 8-hour tours with lunch that cover iconic landmarks like the Financial District, Notting Hill, city markets, street food and old pubs, and give you enough time to get back to the airport to catch your next flight." Be sure and check out their themed tours like "London at Night" and the "Banksy and Street Art" tour. They even have a Beatles tour! Just because you have a nice long layover, doesn't mean you have to leave the airport. Heathrow has relaxing spas in most terminals offering a wide range of wellbeing services and beauty treatments with no appointment required. From on-the-go back massages to first class facilities including private relaxation rooms, luxurious shower rooms, and fully tended bars, there are spa treatments for every taste and budget. Combine that with a taxi ride to a great local restaurant, and you have a relaxing 5-6 hour layover. 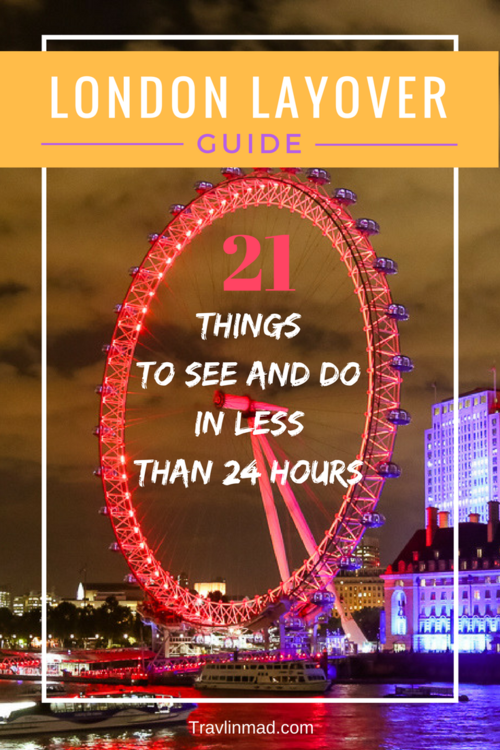 If you’re lucky enough to have a bit more time in the city, or if your long layover turns into a few days in London, these ideas should keep you plenty busy! Take The East End Food Tour - This 3-4 hours London food tour in the favorite locals' places around the city's East End neighborhood. Highly recommended! Girls love to shop! And here are a few choice guides from The Global Creator and MappingMegan on where to splurge! What would YOU do on a long layover in London?